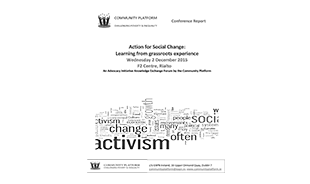 Conference report ‘Action for Social Change’ December 2015. This conference was organised by the Community Platform as a Knowledge Exchange Forum under the Advocacy Initiative. Workshop facilitators used the case studies to lead discussions among participants on how we can strengthen our grassroots advocacy work.